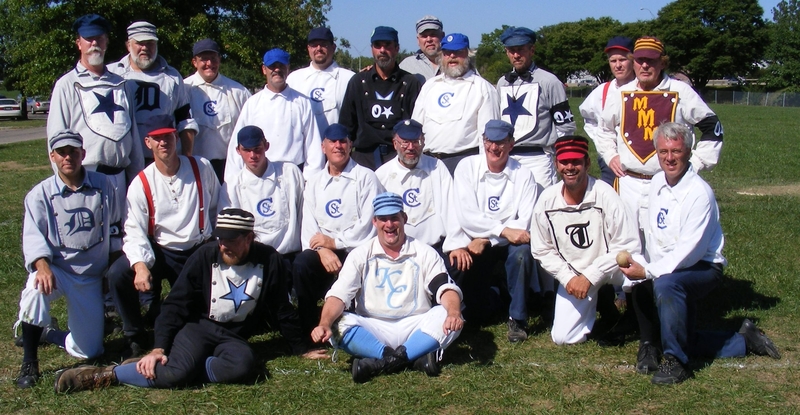 The CVBBA sent a team of ballists, known as the Colorado Territorial Old-Stars, on a Midwest Barnstorming Tour. 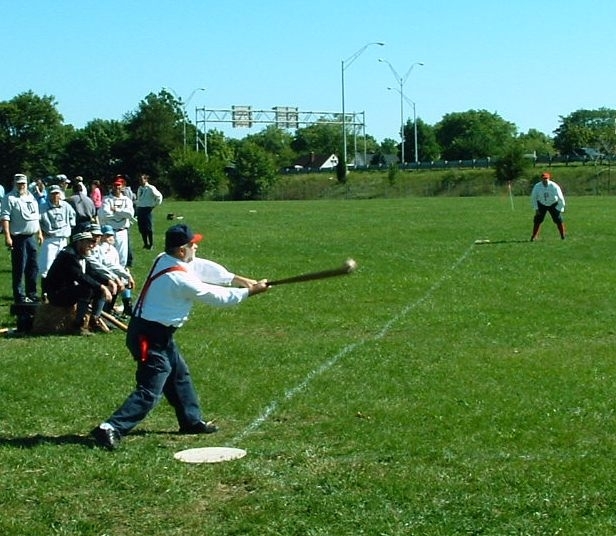 The tour began in Downers Grove, Illinois, wound through northern Indiana and culminated in Columbus, Ohio at the Ohio Cup Vintage Base Ball Festival. 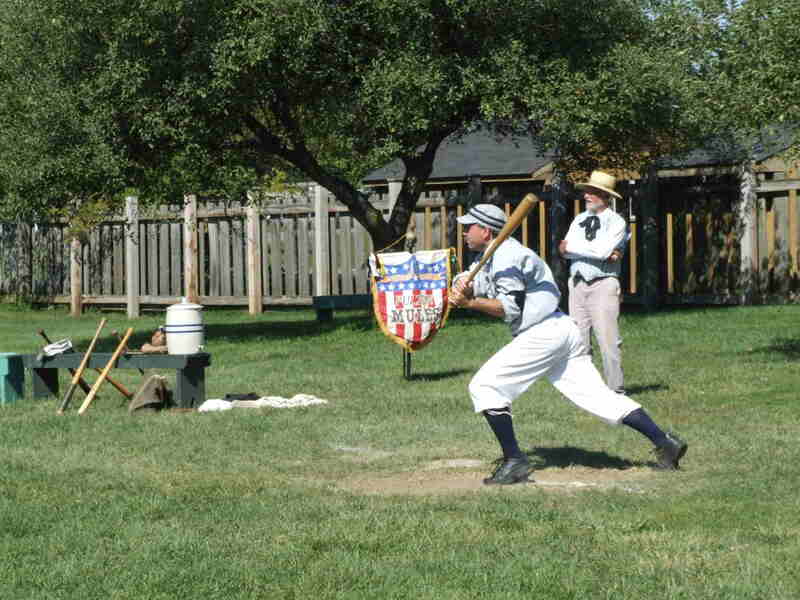 This historic event (the last tour was 1997) proved to be an exciting exhibition of base ball contests with ant-killers, cloud hunters, aces, muffs, and tallies – completed with pluck & ginger, cranks & loose fielding. 12 matches - 6 cities - 11 days – THUNDERATION! 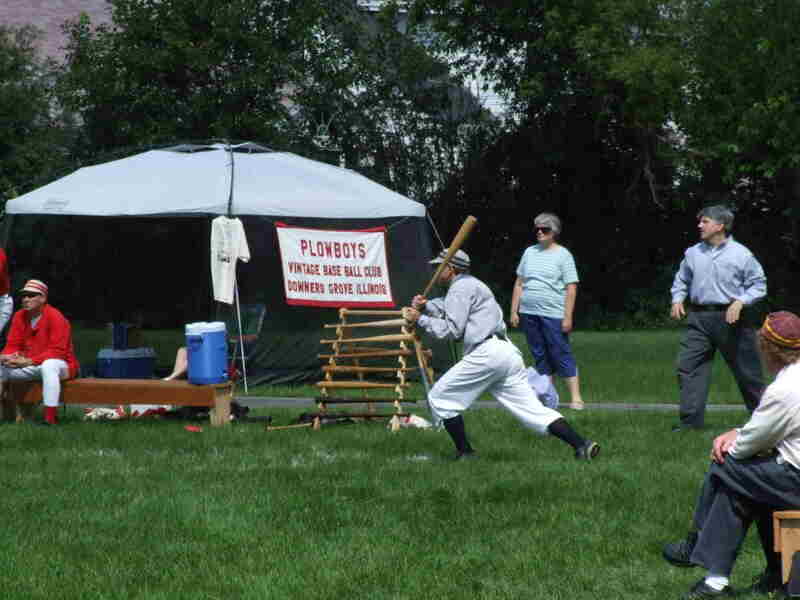 The Barnstormers are on the road and Saturday's two matches with the Downers Grove Plowboys were concluded with two wins for the Plowboys. 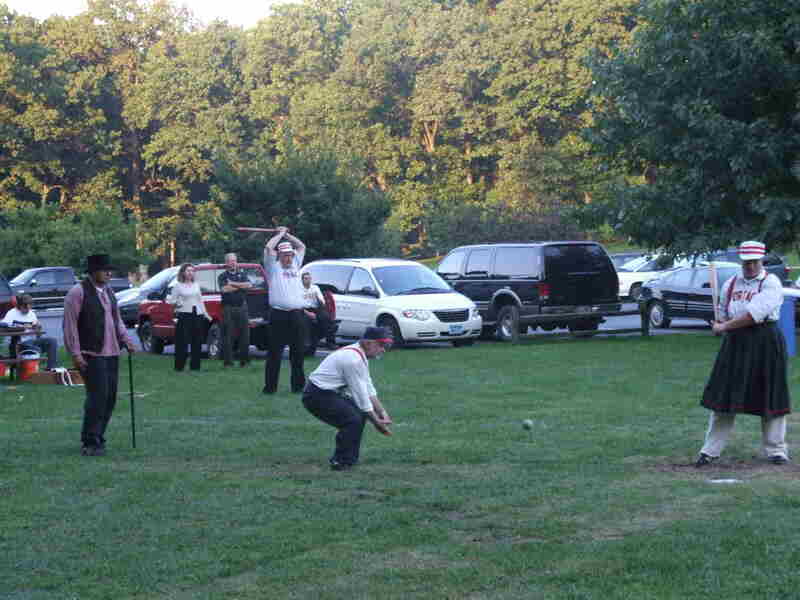 Final tally for the first match was 9 to 2. 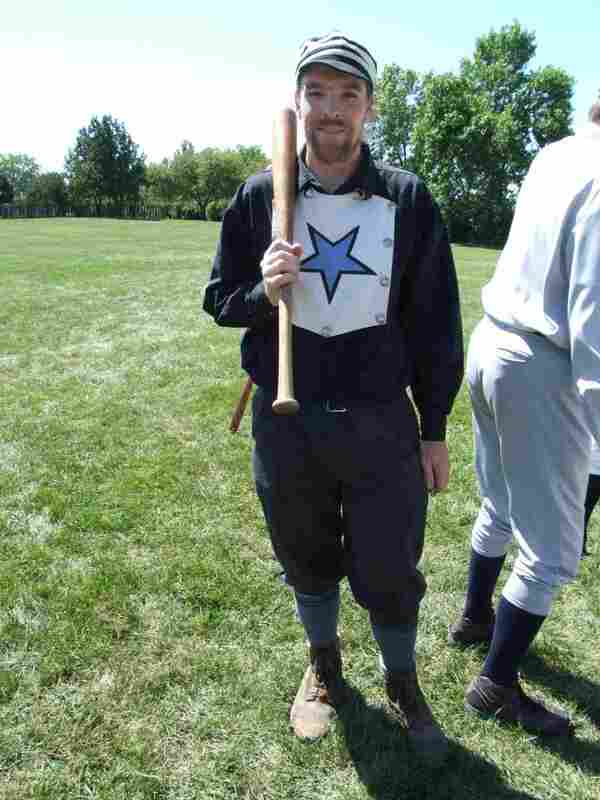 Both aces for the Colorado Territorial Old-All-Stars were tallied by Drew "Wilkes Booth" Frady. 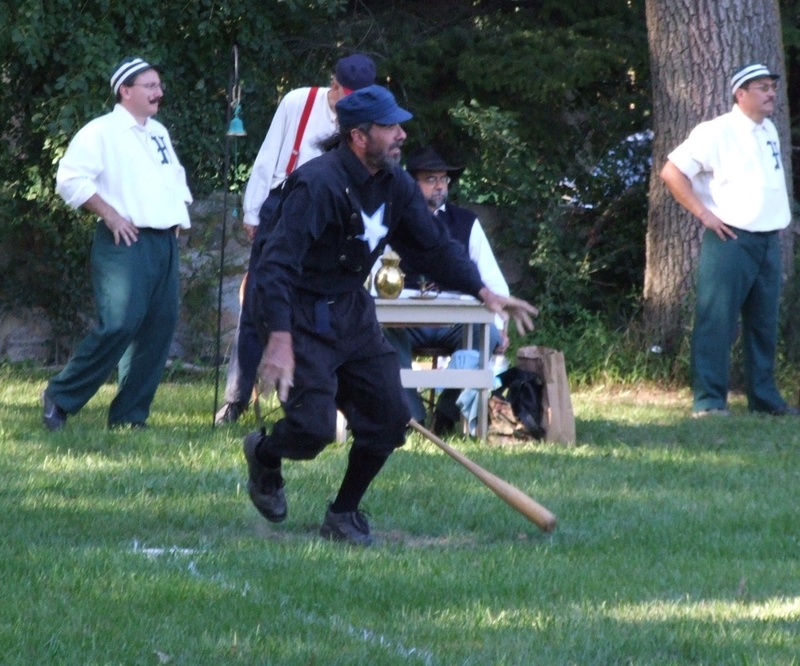 In the second match the Stars were Chicagoed by the Plowboys 13 to 0. Imagine that- Chicagoed near Chicago! 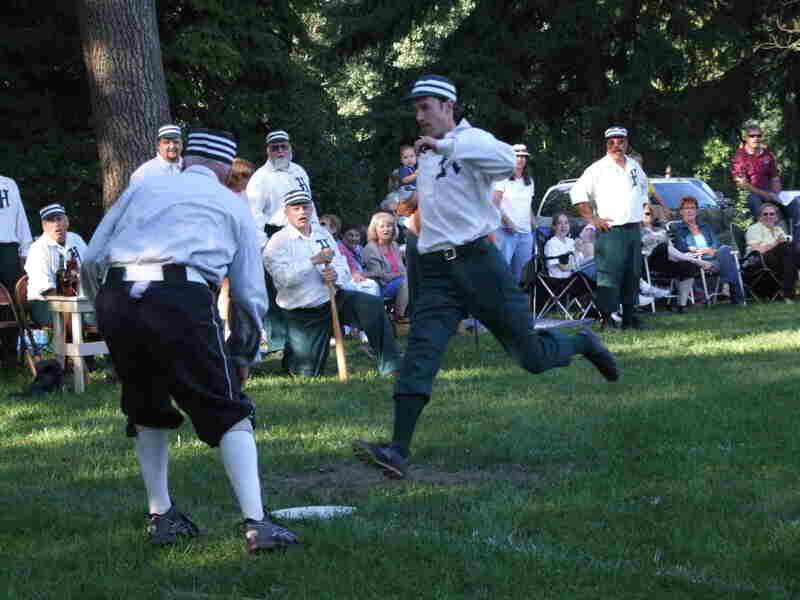 Also the Elk Grove Village Bucks suffered a defeat of 9 to 0 (forfeit) at the hands of the Stars as hurler Ferril “MadDog” Mason was credited with a first-ever perfect game. Injury report: Frady- Hamstring, Harris- Back, M. Foster- achilles, Mason & Wickett- fingers. 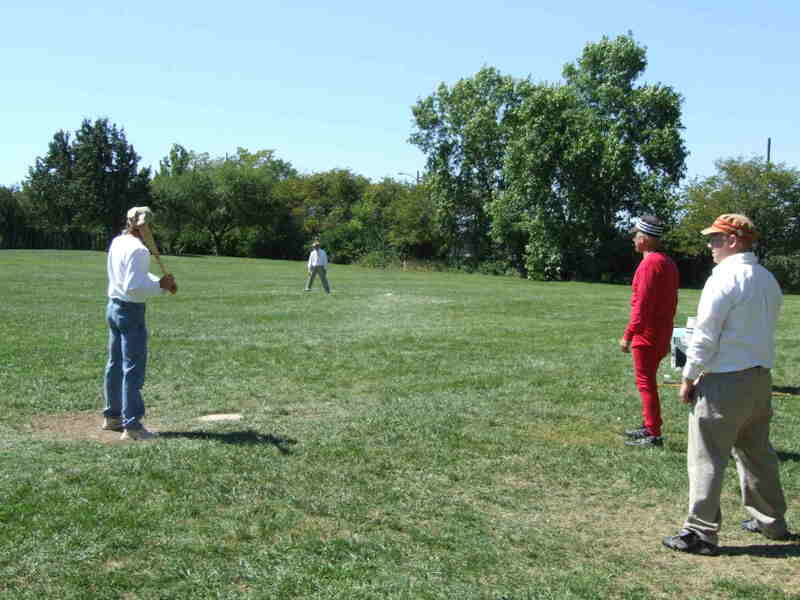 On Sunday, ballists opted to attend the Schaumberg Flyers match against the Kansas City T-Bones. 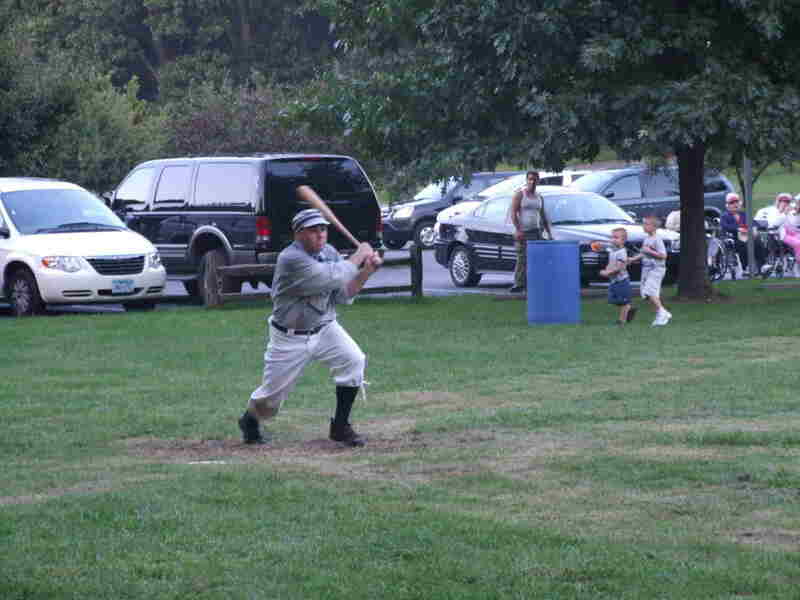 A video of an Olde/All Star striker making it safely to first base can be found here: Rare Hit. 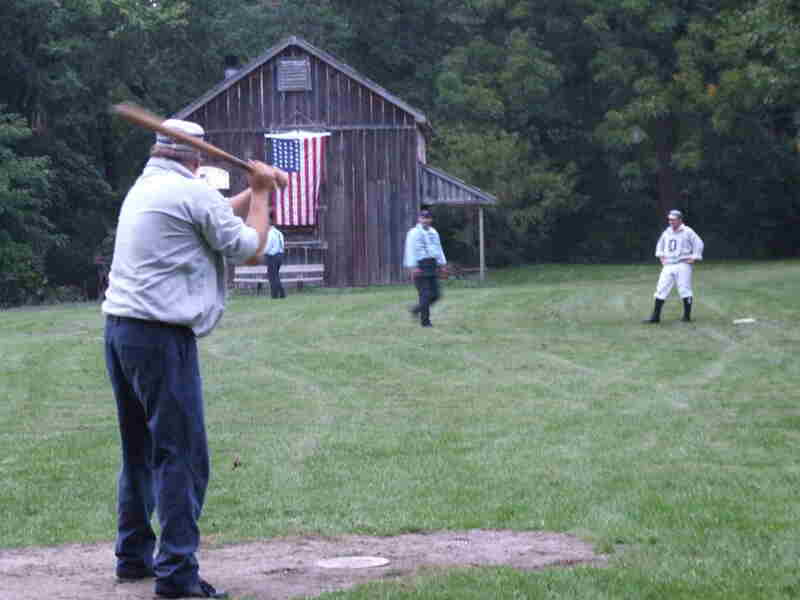 The Territorial Olde-Old-All Stars were hosted by the Bonneyville Millers tonight at Ox Bow County Park in beautiful Dunlap, IN for their third match of the tour. 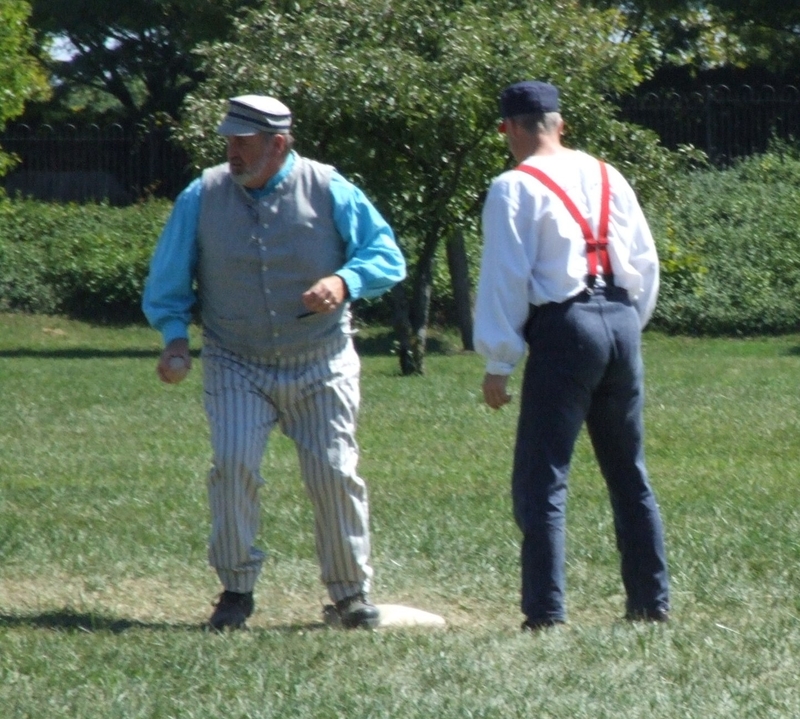 From the outset the Territorials were stifled by the pluck and ginger of the Millers' fielding and hitting as Ian "Traveler" Tinney began hurling to celebrate his 60th birthday. 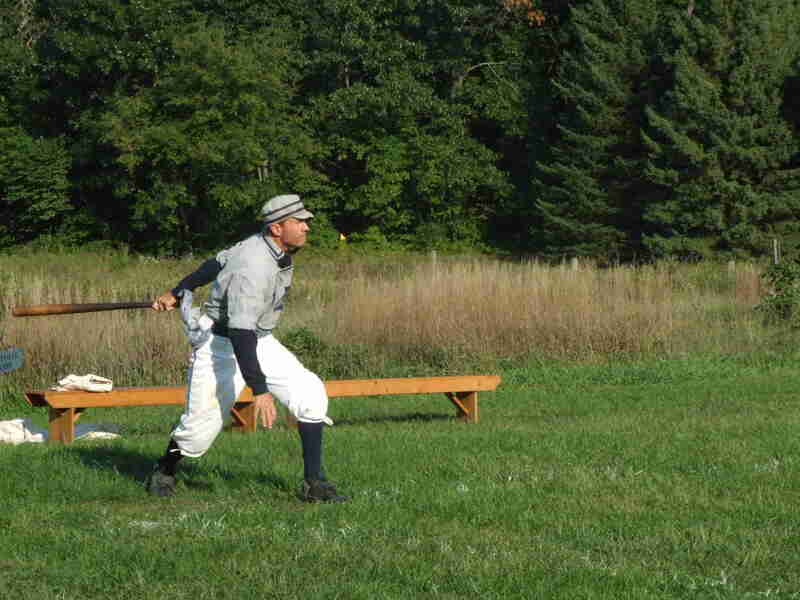 Traveler also celebrated with three hits at the strike. 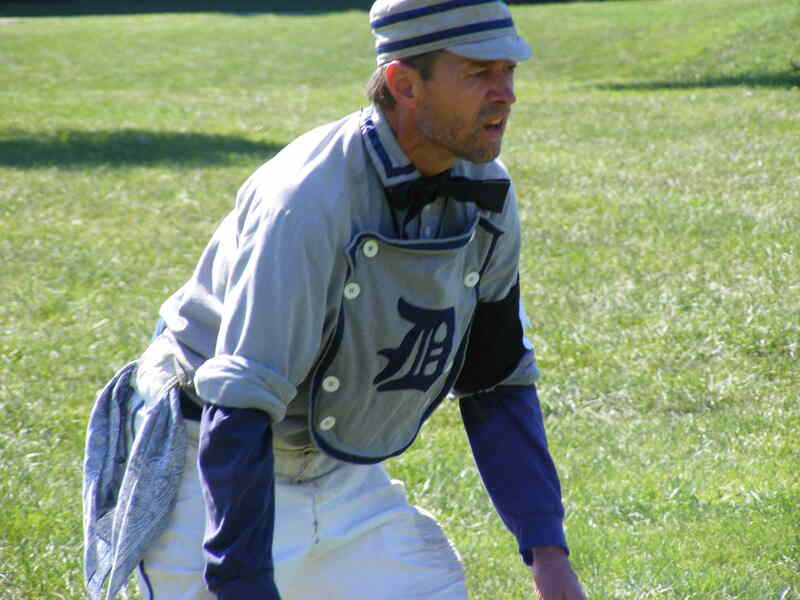 The O-O-Stars shone on a few plays, most notably Paul "Wheels" Harris' defensive activity as left field scout especially when he turned around a "foul ball" call from the Umpire when he spectacularly caught the ball on the first bound on a hippodroming-style slide. 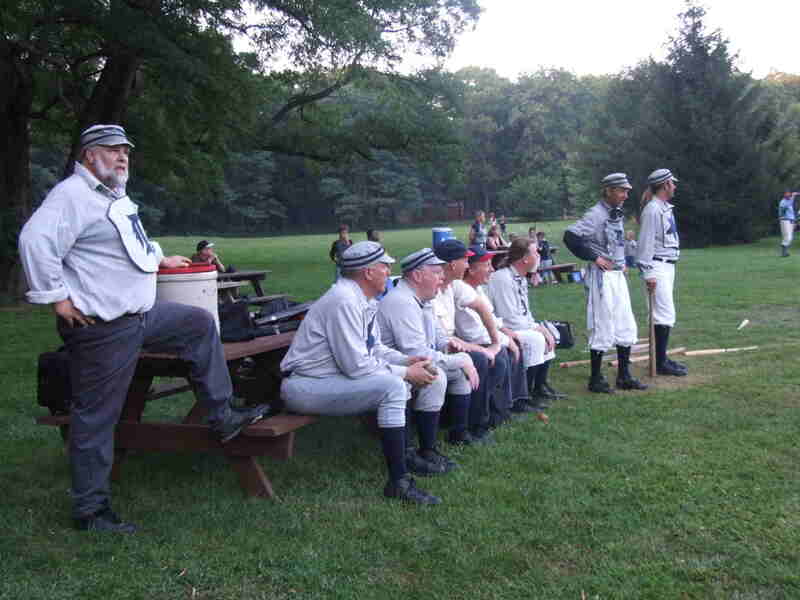 The touring All Stars seem to be continually suffering from a few minor injuries and the effects of Midwest humidity. 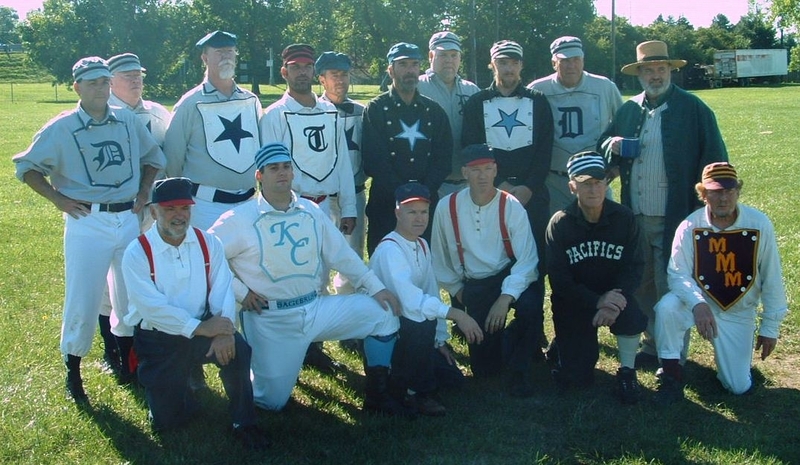 In fact, the Olde Stars' gear may be permanently damp until the return to the high prairie. 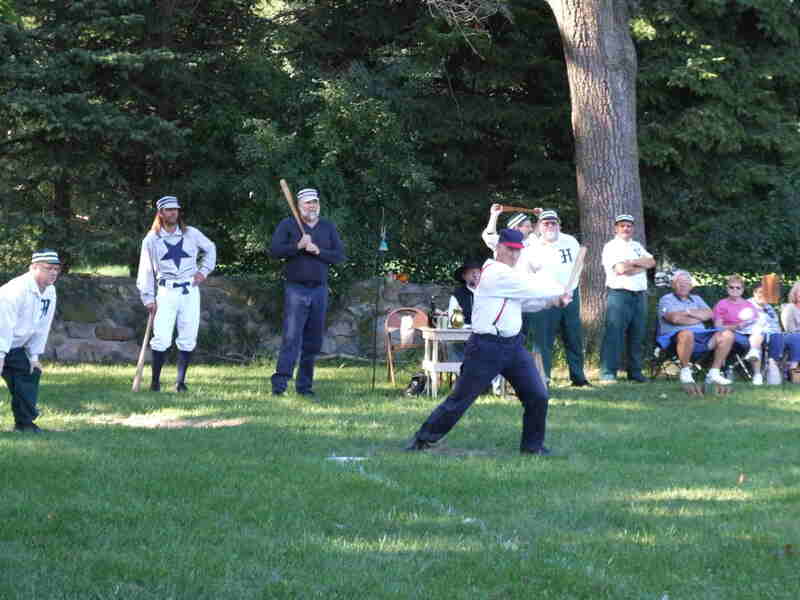 The final tally: Bonneyville Millers 18, Colorado Territorial Old-All Stars 4. 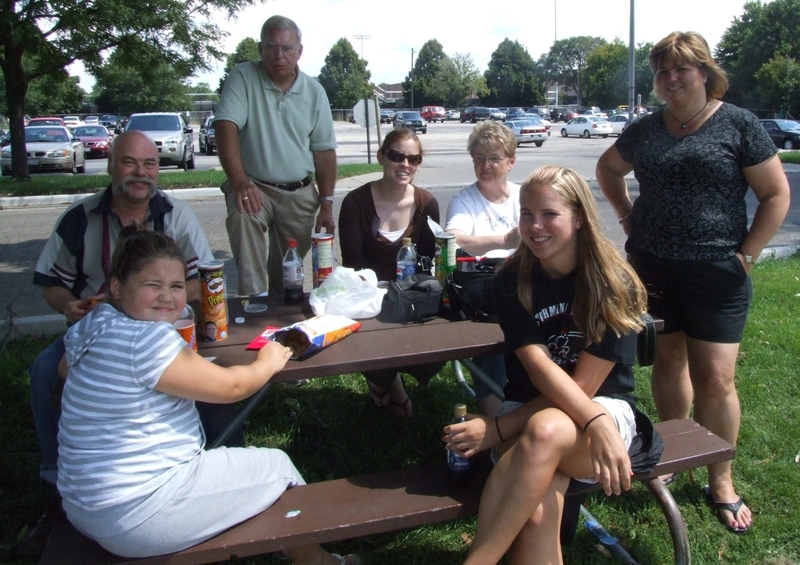 The Millers (a rather large family of Millers) and one Yoder shared and enjoyed a splendid repast following the match. 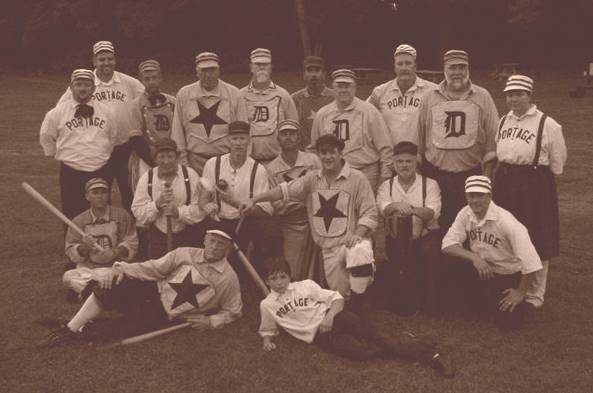 The match with the Portage Iron Diamonds was one of pluck and ginger; this time coming from the Territorial Old-All-Stars. 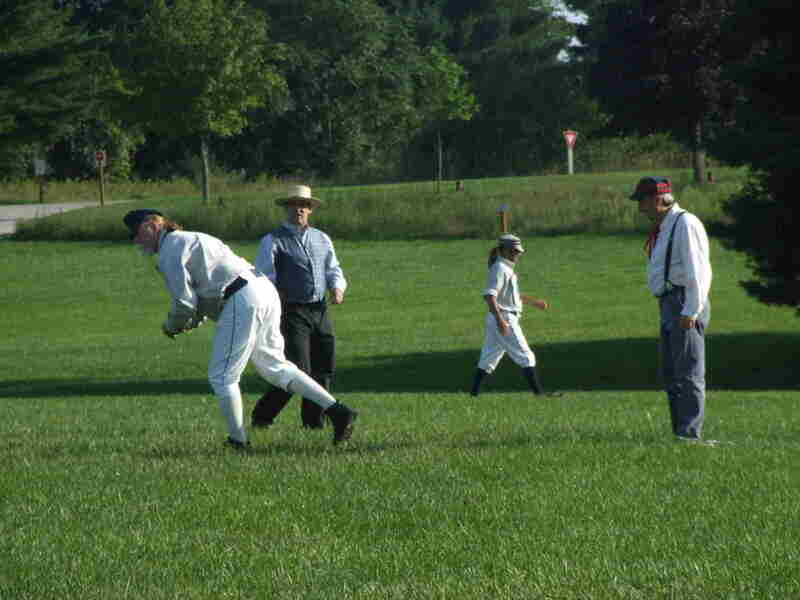 Many hits and tallies were recorded by the Territorials to bring them out of their slump of three previous losses on the road. 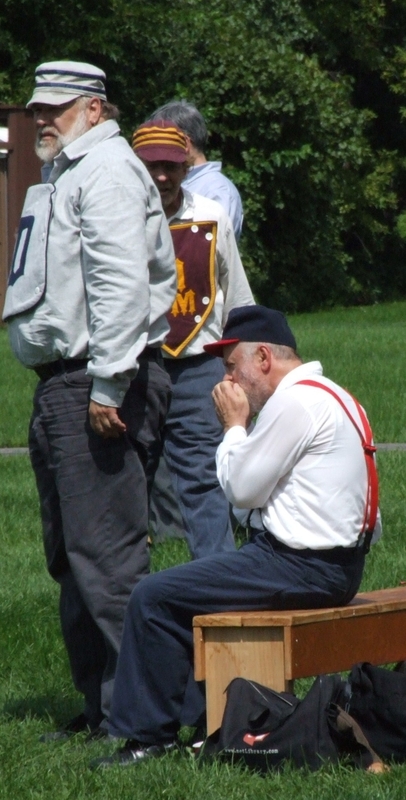 Excitement was stirred as the cranks made noise and played drums, bugle, and tambourine to support their local team, but to no avail. 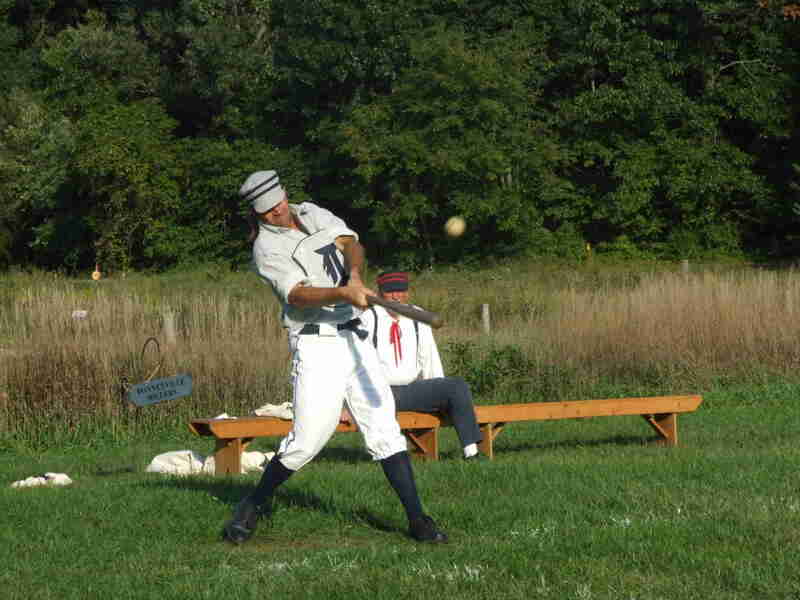 A fine exhibition was displayed by all ballists in attendance (while breaking in a novice umpire who made excellent calls from his position behind the behind). 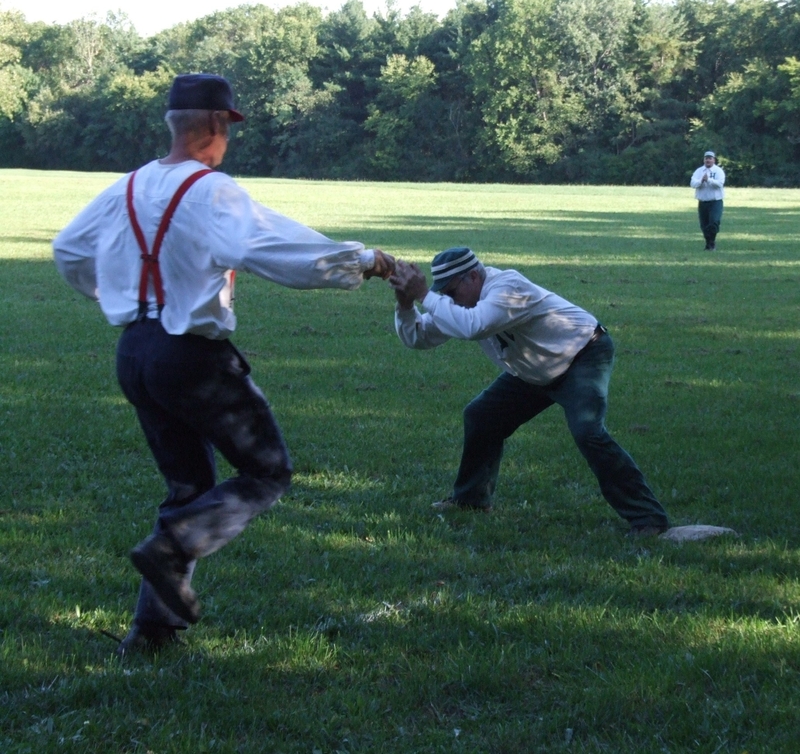 In the end the Territorials held the Iron Diamonds to a final tally of 10 to 1. 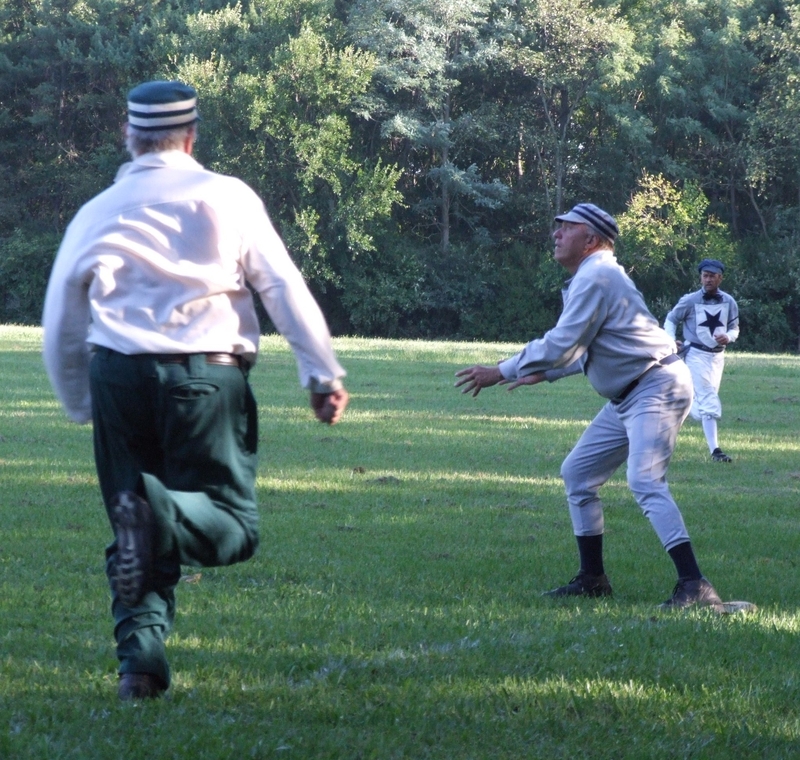 All-Star defense sprung into action at every opportunity (a few balls found their way into the brush and had to be located with the assistance of both teams). Following the match the teams retired to a wonderful dining experience and cordiality. 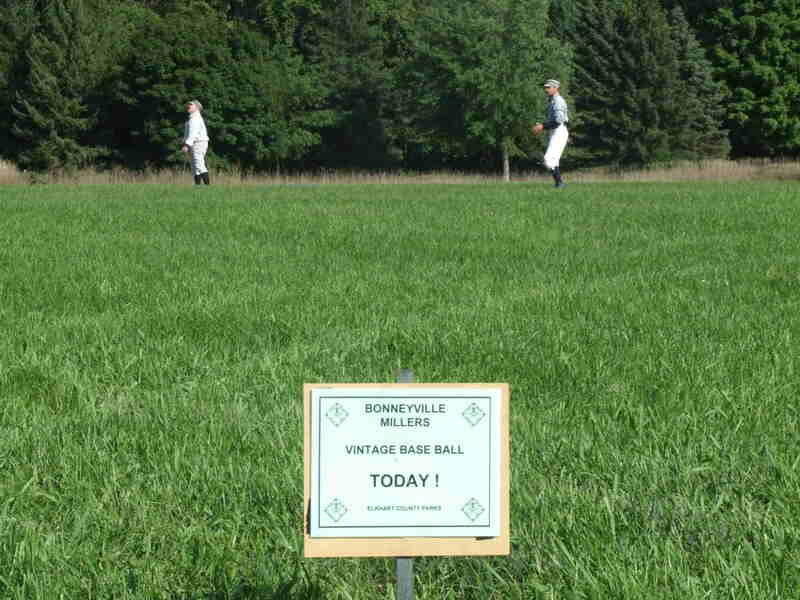 Today the ballists plan a visit to the famous sand dunes on the southern edge of Lake Michigan. 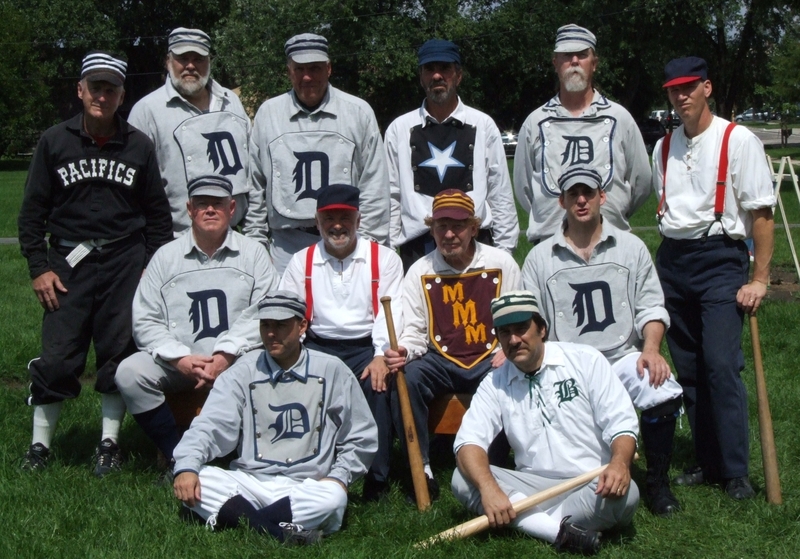 Today, the Colorado Territorial Old-Olde-All-Stars traveled to Grinder Field to be hosted by the Deep River Grinders for a match that proved successful for the hosts. 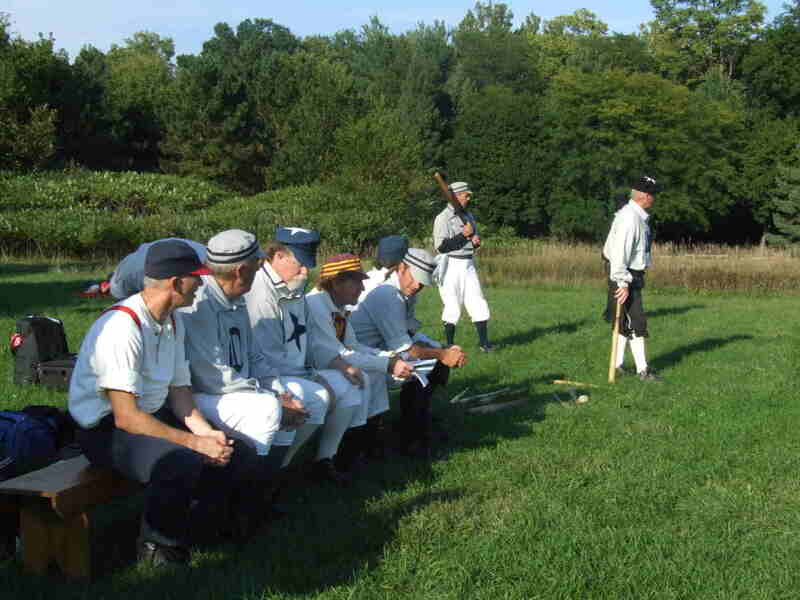 The Territorials were introduced to the Grinders and multitude of Cranks that showed up to cheer the ballists. 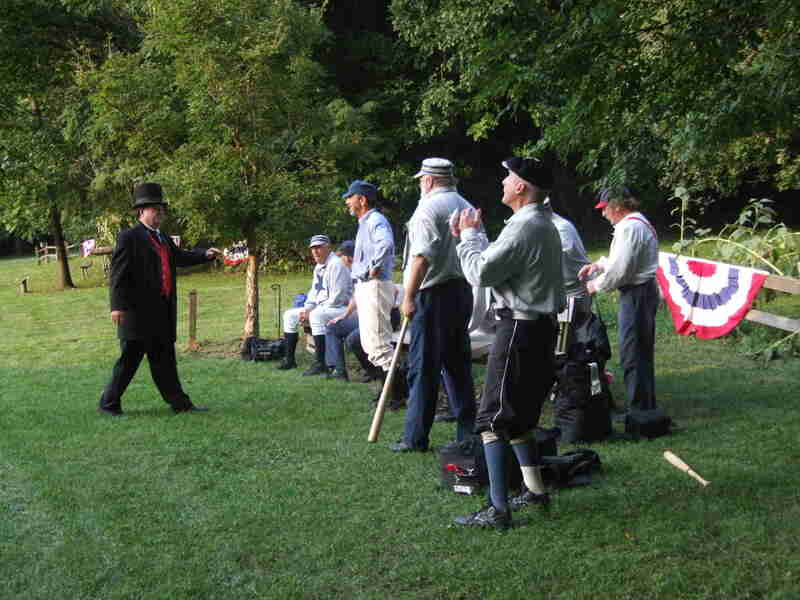 The umpire took the time to explain the rules of the day's match to the visiting Territorials and mentioned the many obstacles on the field including the Sugar Shack, Sawmill, and Deep River itself. 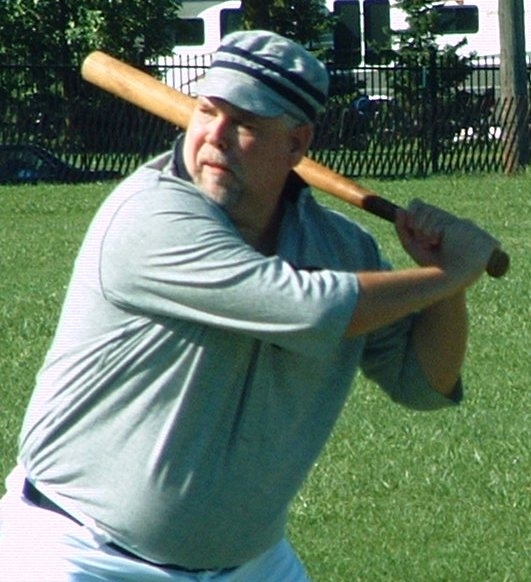 Highlights of the match include Paul "Wheels" Harris' fourth inning triple followed by Bob "Buckeye" Mitchell's single to drive in Wheels for the only Territorial tally. 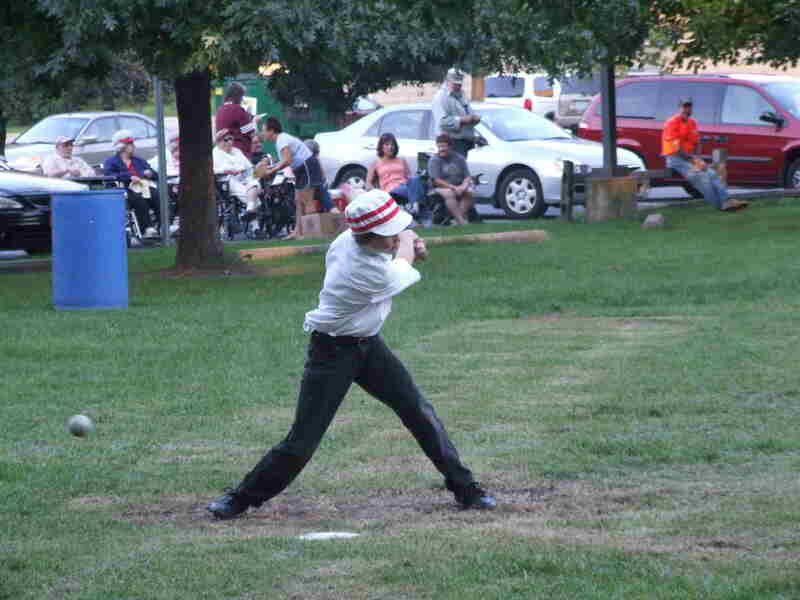 The Grinders began their tallyng in the third inning and finished with a final of 12 tallies for the match. 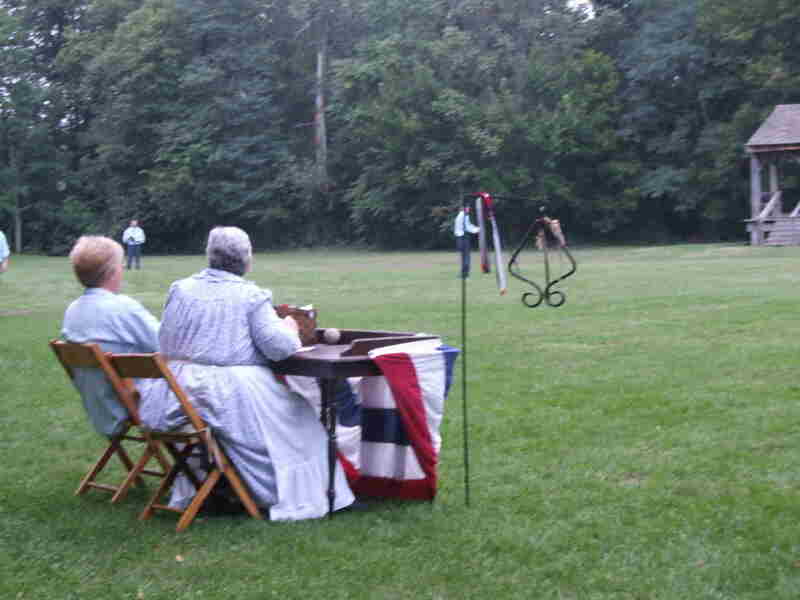 Following the match, the Grinders invited the Stars to a feast and frivolity which was enjoyed by all. 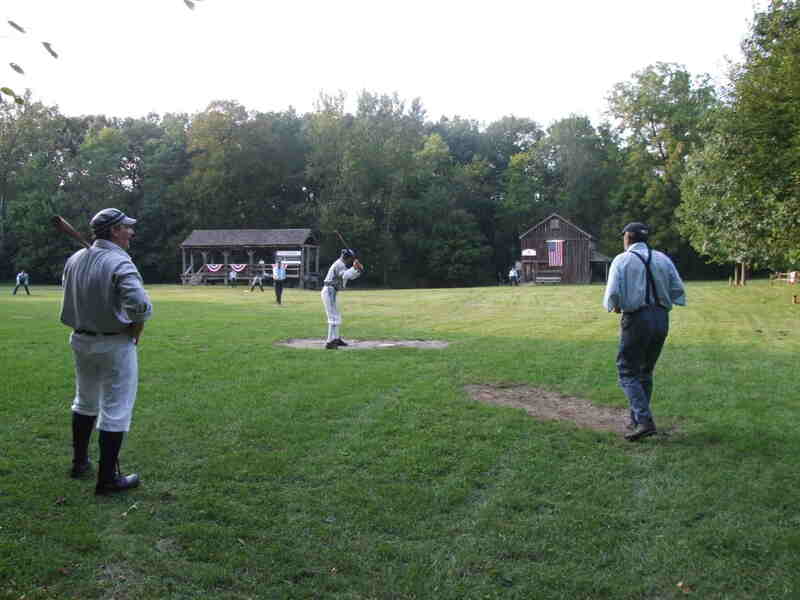 A short video of this match can be found here: Deep River Grinders. 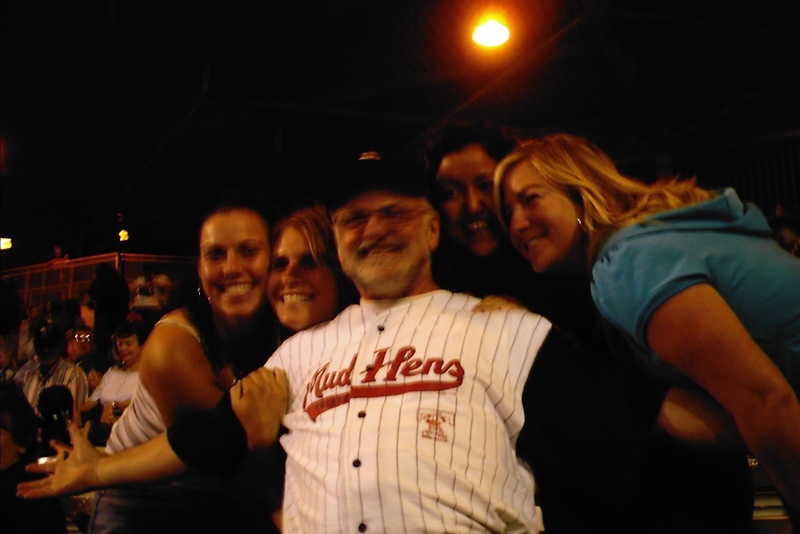 Barnstormers traveled through Bippus to get to Huntington to be hosted by the Champion Hill Toppers. We were met at the Good Shepherd Monastery by Judge Gibb who took us to our lunch destination and tour of the town. Time restrictions prevented us from touring the Dan Quayle Museum. 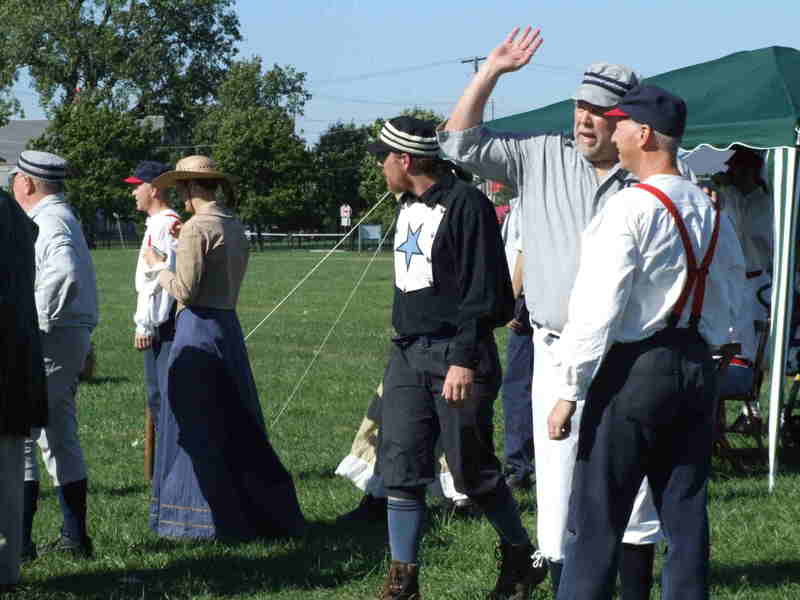 Later in the day as the ballists were introduced for the match the Barnstormers were presented with the keys to the city by Hizzoner the Mayor. 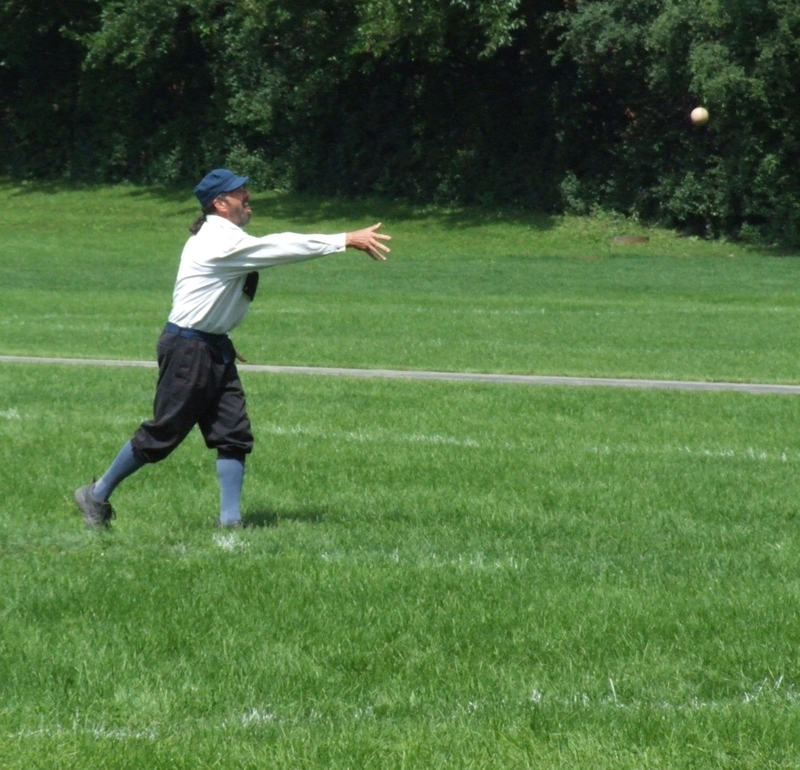 The Hill Toppers were in top form as were the many Cranks in attendance. 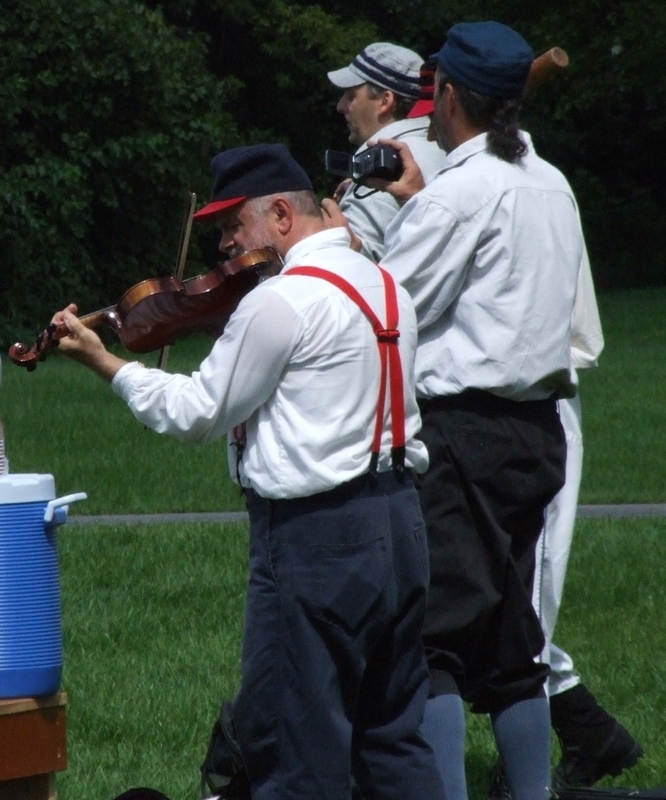 Thespian theatrics were the event of the day as well as tallies by both teams -- Cranks got into the act and sang along with musical entertainment provided by fiddle and guitar. 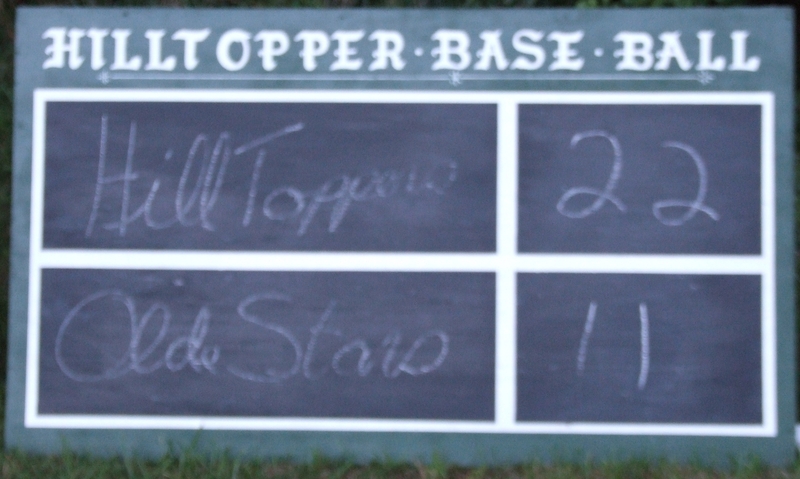 The final tally came to Hilltoppers 22 and Territorial Old-Stars 11 (9 aces tallied in the top of the 8th inning by the Stars). 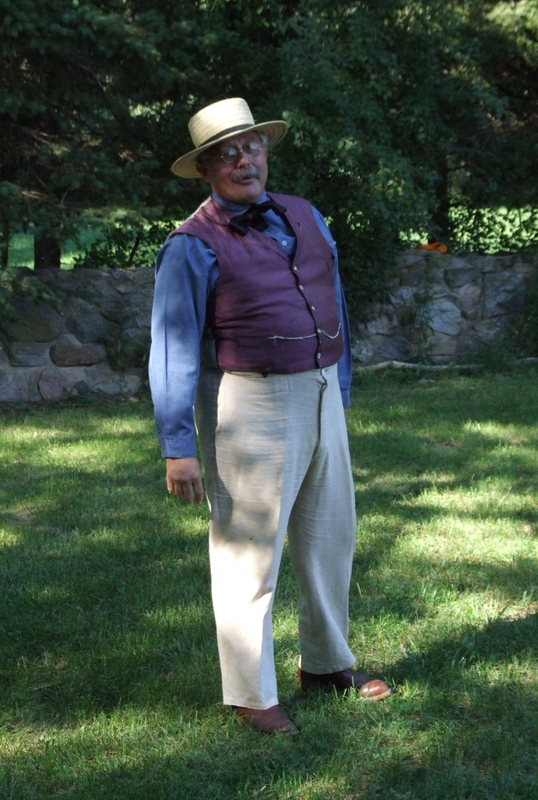 The exhibition was followed by jovial cammaraderie and fine dining by the ballists provided by our gracious hosts. 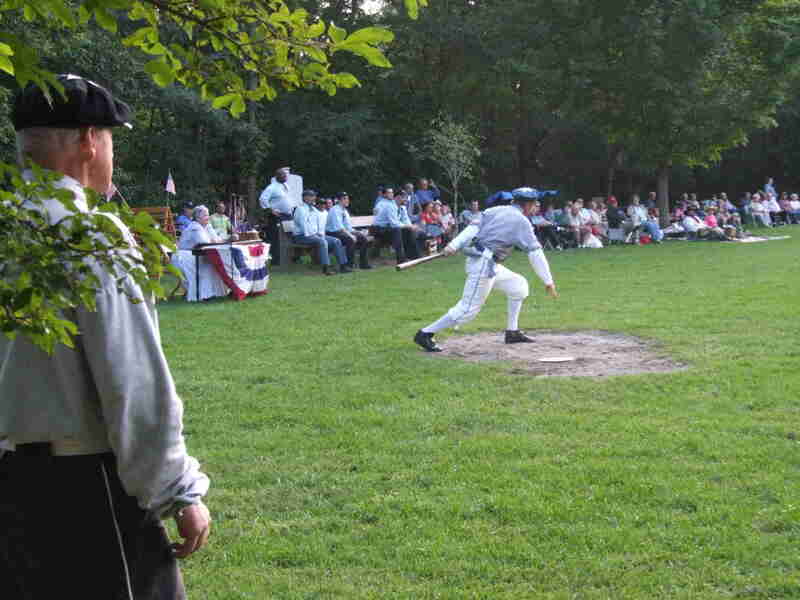 A short video of this match can be found here: Champion Hill Toppers. 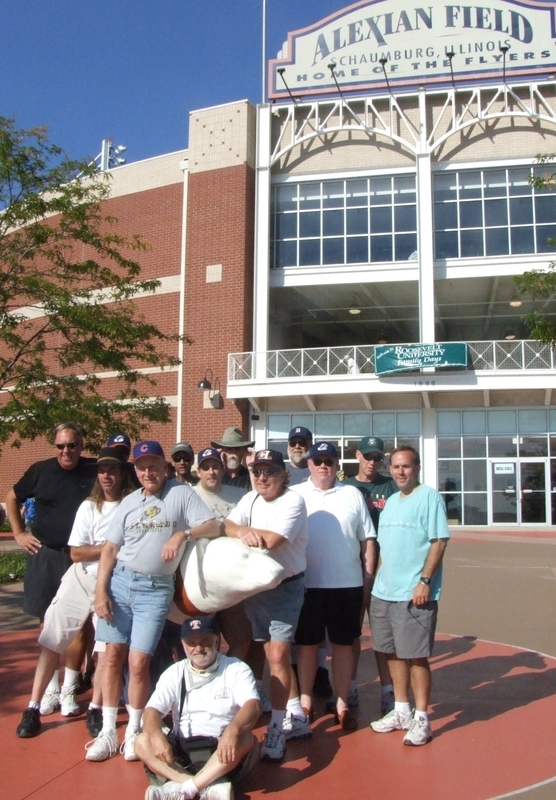 Following a day off Friday to travel to Columbus and attend the Columbus Clippers/Toledo Mud Hens game (Hens won) the Old-All-Stars headed to the Ohio Historical Society Ohio Cup Tournament for three matches. 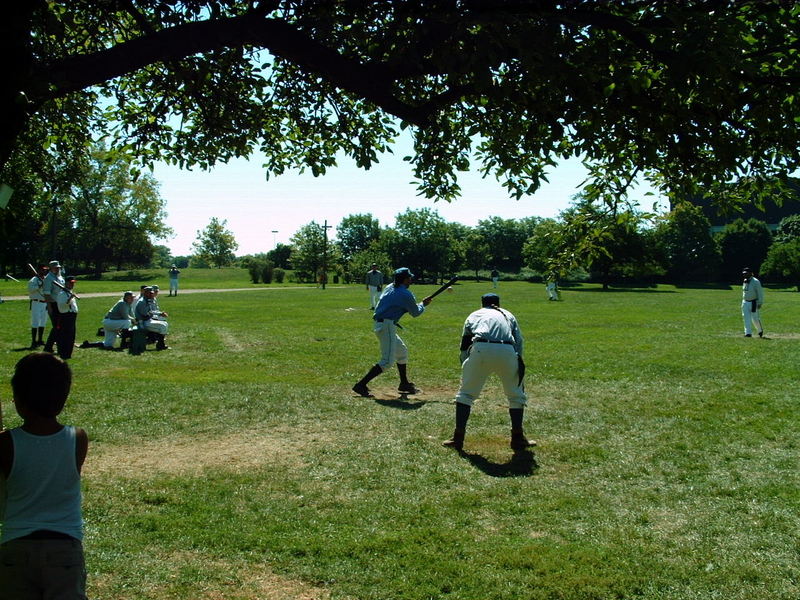 The matches were held at three different fields during the day. 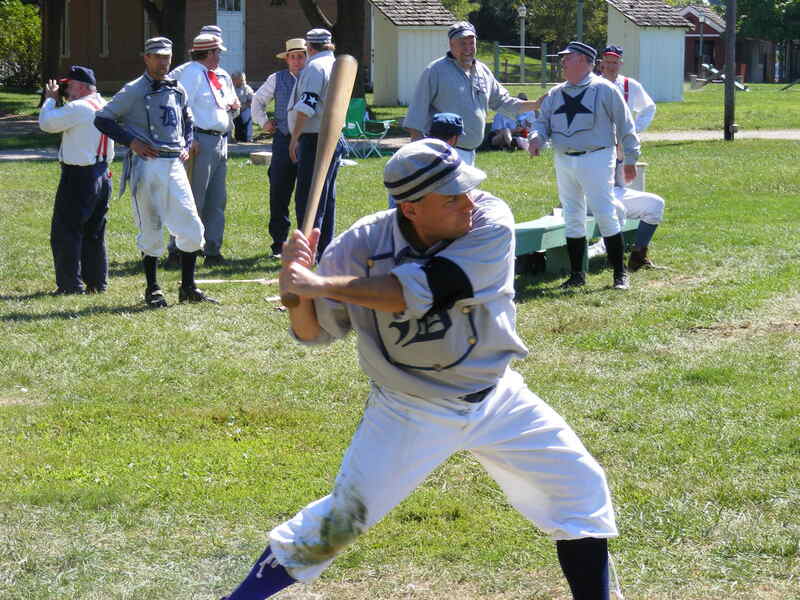 The first match pitted the Stars against the St. Louis Perfectos where Rigger Mortis' bat finally warmed up striking two hits at two at bats. 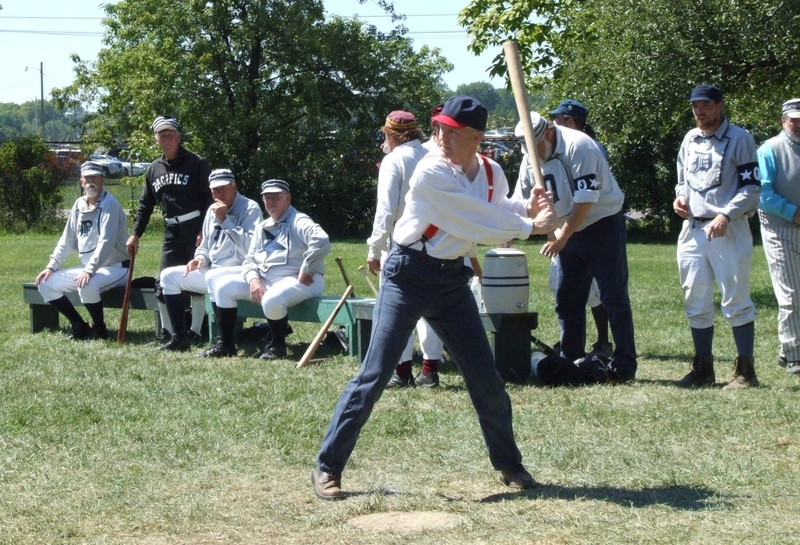 This was not enough to carry the Territorials and the final tally resulted in a victory for the Perfectos (6 to 2).In the second contest the Olde-Stars were no match for the club from Porkopolis, the Cincinnati Red Stockings, as the Territorials were Chicagoed 8 to 0. 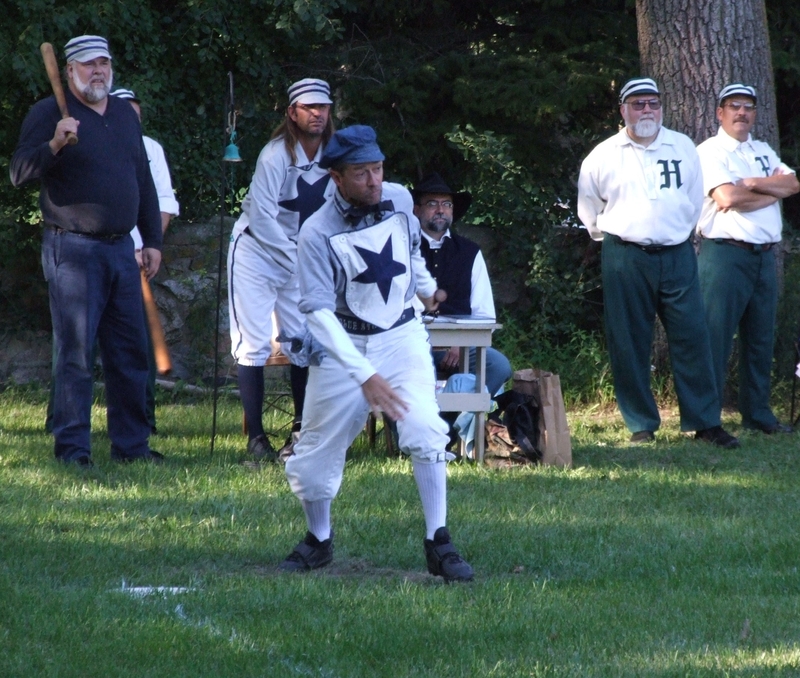 The third match showed a much better final tally even though the Stars came up short against St. Croix of Minnesota, 5 to 3. 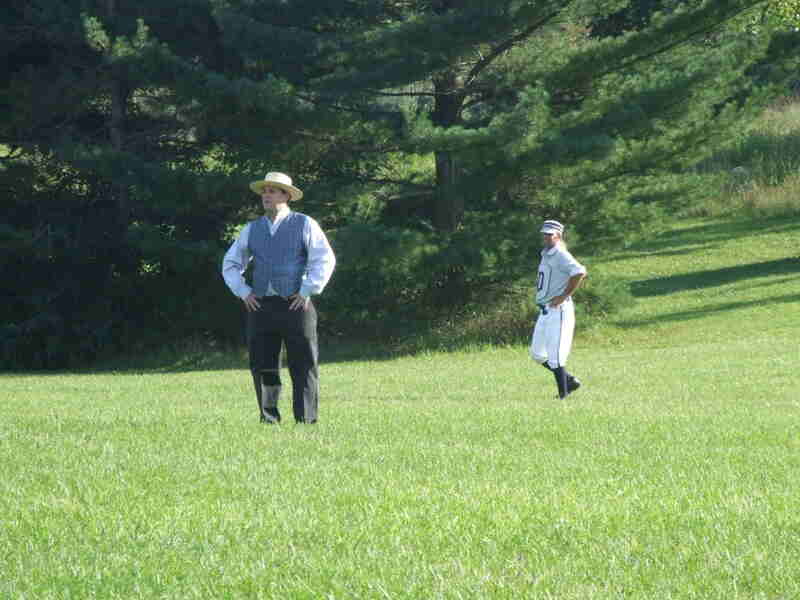 Still, a wonderful time is being had by all ballists and cranks at the Ohio Cup and we look forward to more activity at the striker's line and in the field on Sunday. 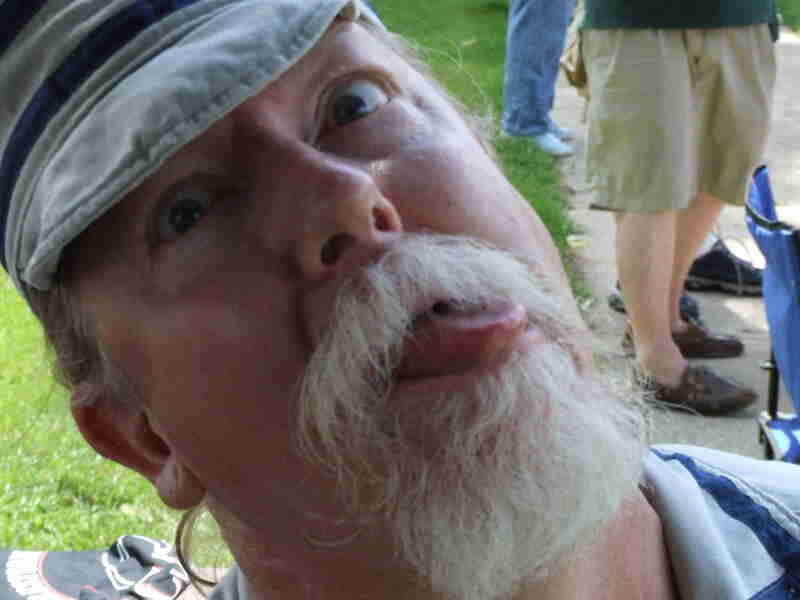 A short video of a ballist striking a sky-scraper can be found here: Tom "Dutch" Morris. 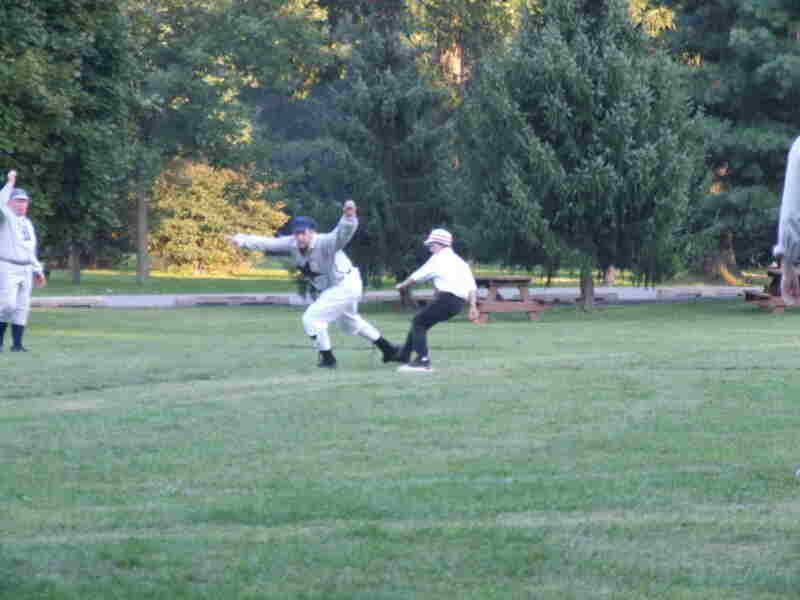 Yet, another beautiful day in the Ohio capitol on the second day of the Ohio Cup Tournament. 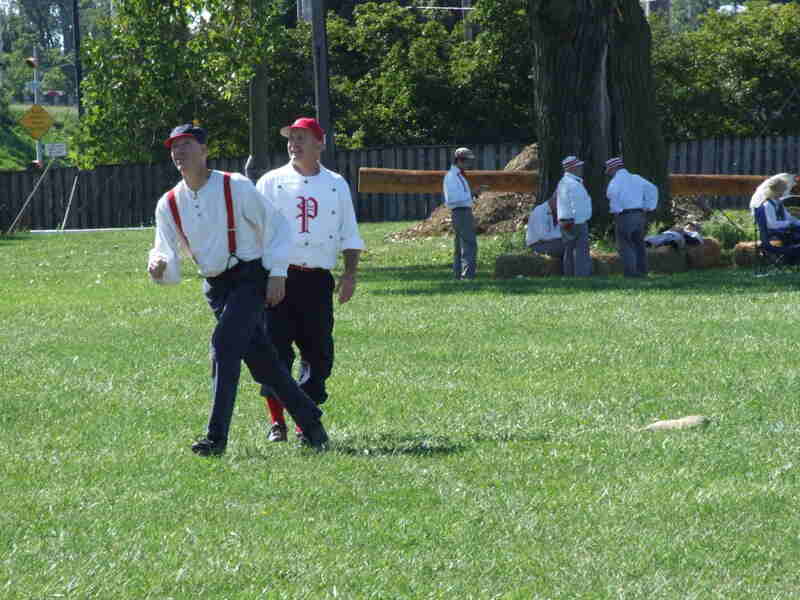 Tired as the Barnstormers were, they continued to play the brand of base ball by the Midwest rules (sometimes ever-changing depending upon umpire and which field of play within the Ohio Historical Society grounds). 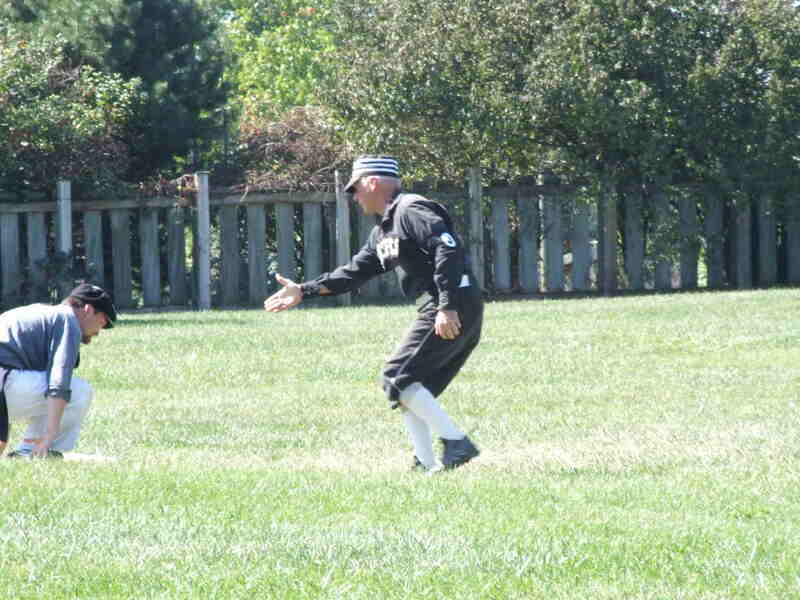 The first match on Sunday found the Colorado Territorial Old Stars facing the Canal Fulton Mules. 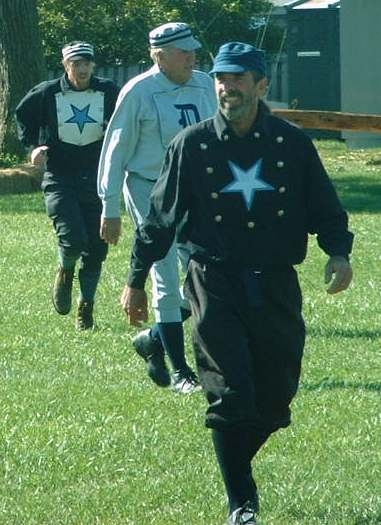 The final tally of the match found the Stars being Chicagoed by the Mules 6 to 0 by the tally sheet. 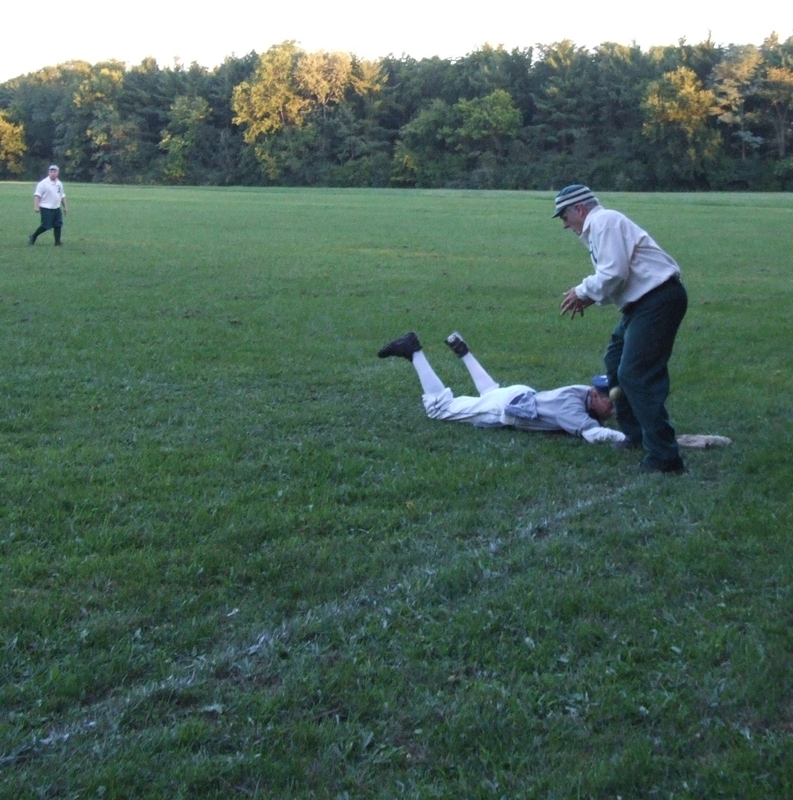 In the second match, the Territorials returned to the playing field with pluck and ginger. 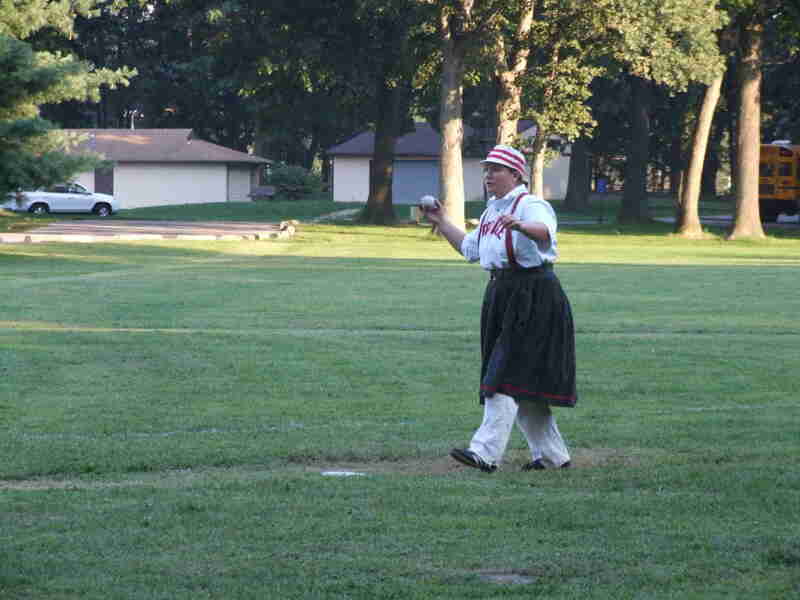 The result was another Chicago as they defeated the Ohio Village Muffins 5 to 0. 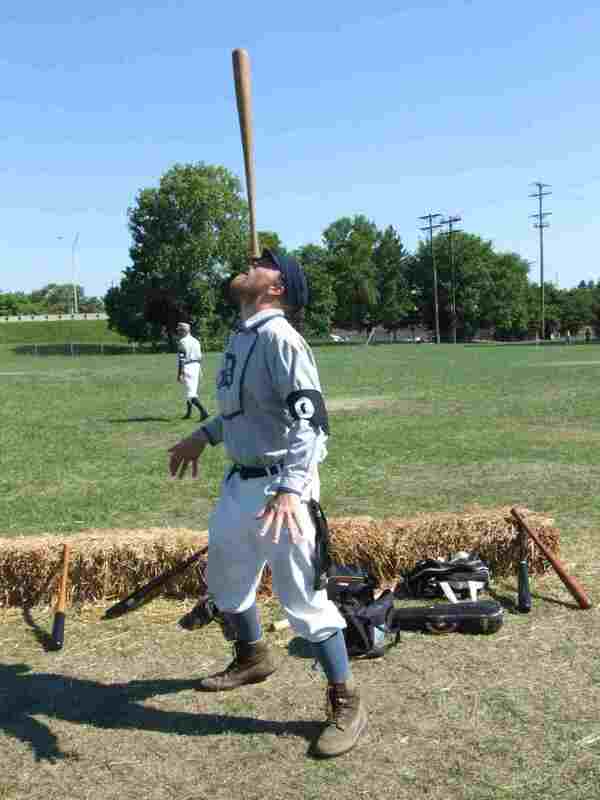 Huzzah! 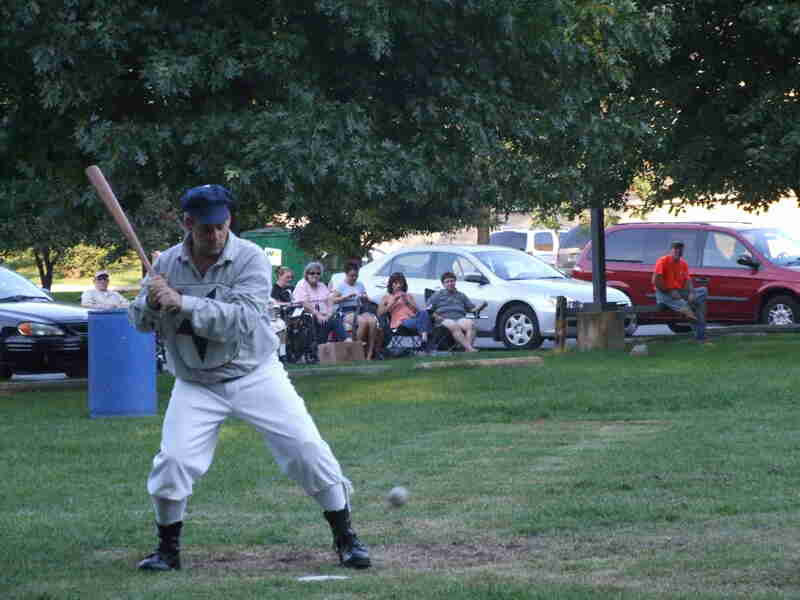 The final match of the tournament for the Barnstormers (and last match of the barnstorm tour) pitted the All Stars against the Sycamore Grasshoppers. 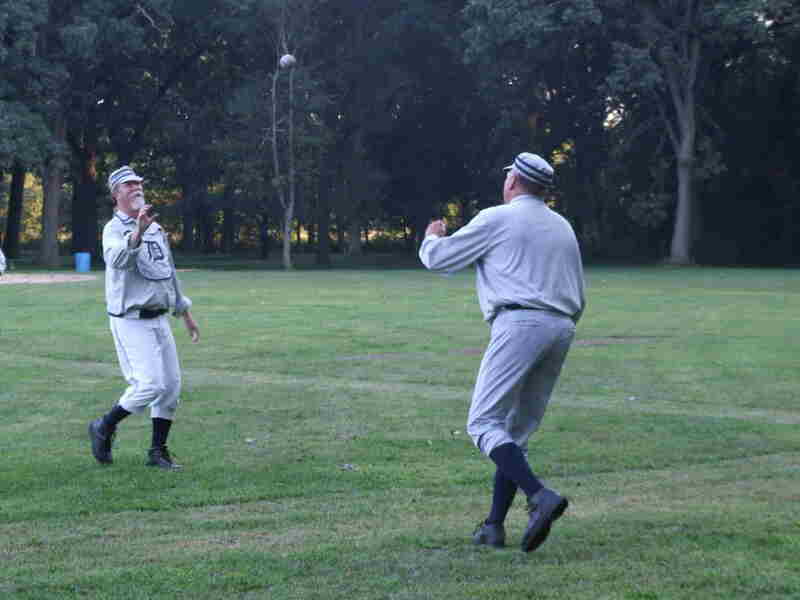 Sky balls, daisy cutters, muffs, and a few balls bounding over the fence ensured a very competitive match as the tired ballists hung in to the end in a fine match. 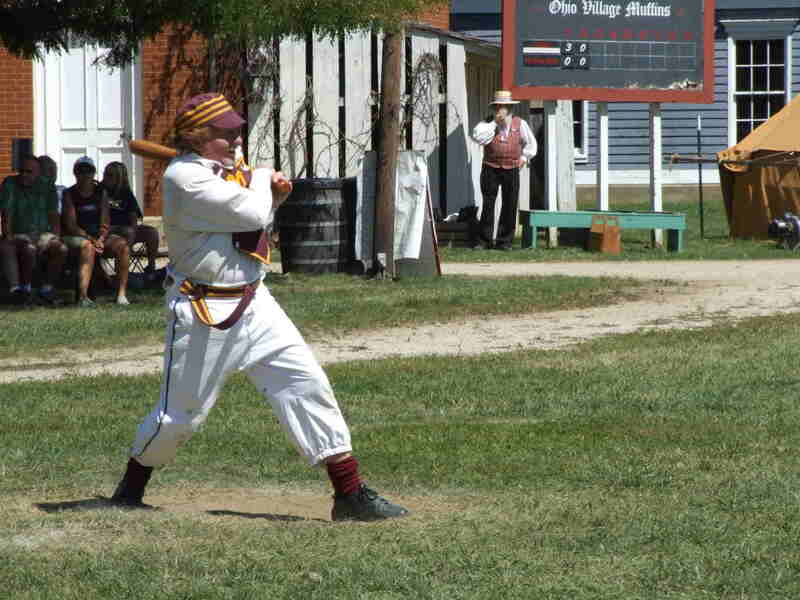 The last tally showed the Grasshoppers defeating the Territorials 11 to 4. 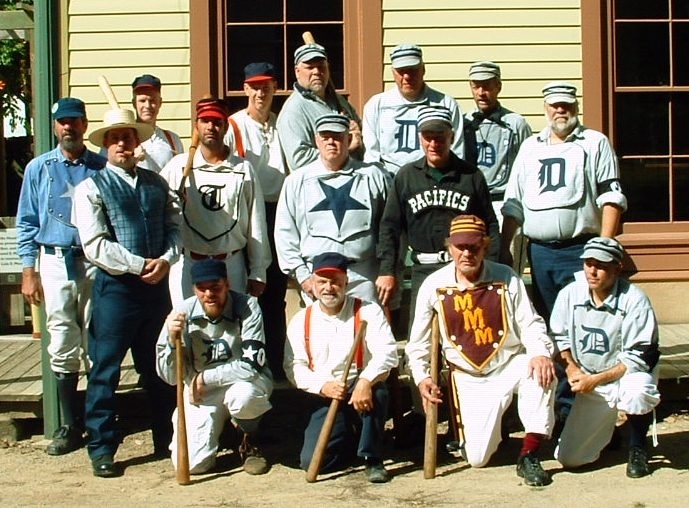 As expected, a fine time was had by all and the Colorado Territorial Old-All-Stars begin their trek from Columbus, through Chicago, toward Denver and home. 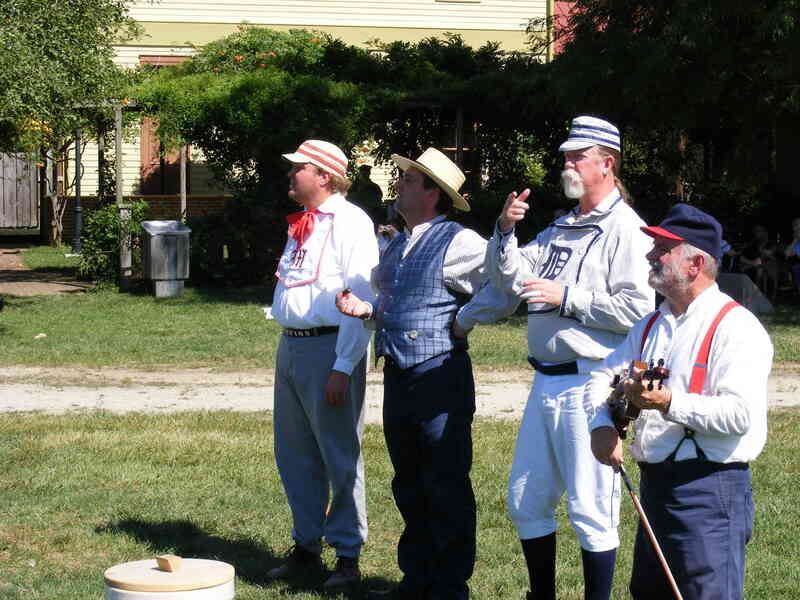 It is certain that each ballist and crank had an excellent time during the tour and are looking forward to a welcome home and well-deserved rest from the road. 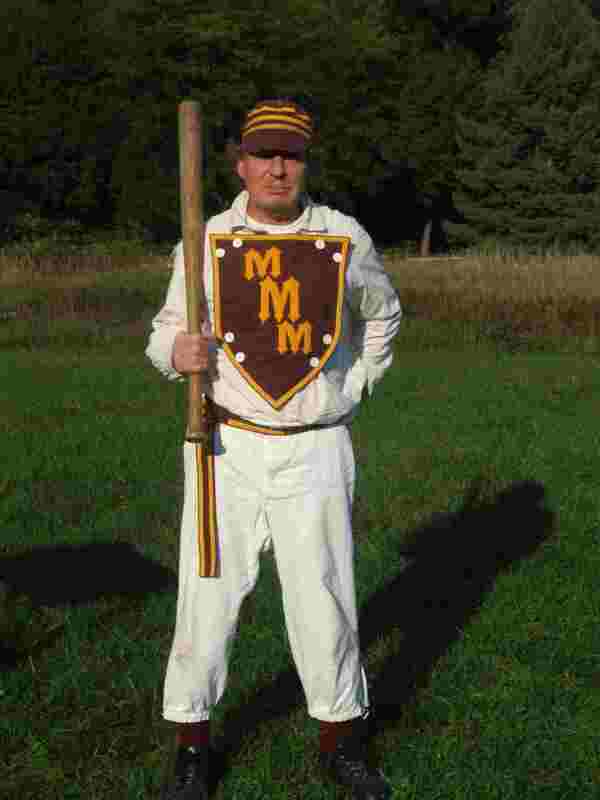 Special mention should be made of the ballists who flew in especially for the Ohio Cup to help relieve the players from the road and offer assistance at the striker's line and in the field: Dathan "Cannibal" Tinney, Pat "Deacon" Massengill, Tom "Dutch" Morris, and Richard "Rube" Foster.